From Kakka to Pappa..a journey of 18 months. Loveson and Adith during ‘Touch a truck’ event. My eldest sister’s kids used to call me as ‘DiyaThochamma’ instead of ‘DiyaKochamma’ when they were young. Even though they were hearing kids and easily mastered all the other sounds, ‘k’ was difficult for them. This is typical of many hearing kids. The first sounds of a typically developing child will be “m”,”p”,and “b” because they are the frontal sounds. Relatively easy to produce because it requires just putting your lips together and then opening it with or without pressure. And this is why a baby’s first words are mama, papa, baba etc :). Children with hearing loss also follow the same pattern generally, but not Adith! His earliest sounds were |aa| and |k|.Then came |ee|.He had no other sounds and tried to say words with these sounds. This meant he called Loveson as Kakka (Pappa) and said Ki for milk. . Slowly he began to say the other vowels but had a hard time with the consonants. ‘K’ was substituted for every consonant in a word so it was ‘cook’ for book, ‘Ko’ for ball, ‘kuk’ for cup, ‘Kee-yah’ for clean up,’keegi’ for baby and so on. If I moved a toy car over the sofa and said “up, up, up”, he would do the same and say “uk,uk,uk”! Rofina Babin(right) with Adith and me. like Vaa (come) and Thaa (give me) and also the sounds b and p. I was amazed by her energy, skill and passion – she was just superb! Though Adith did not start saying the sounds ‘b’ and ‘p’ (he could say ‘m’ at times) before we left Mysore, I knew he had received the best therapy ever! Playful, intense and actually making a difference! I thought about the Speech Therapist who was coming to our US home through the Early Intervention program. Though I was not happy with her sessions and often doubted if Adith had any gains, I had continued with her since I did not want to offend her by asking a replacement and moreover had no idea how speech therapy should actually be! 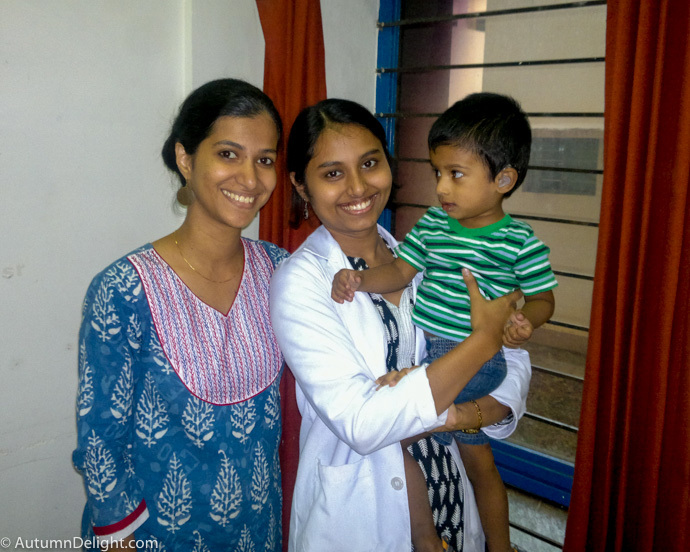 My Mysore experience gave me a first hand knowledge of how an effective speech therapy should be and as soon as I came back to US in Jan 2014, I asked for a new speech therapist. Meanwhile, Adith had begun to say “m” frequently and had finally begun to say “Amma”! Phew! He also started to say functional words like “more” and “my”. My decision to change the therapist also turned out to be fruitful. My new therapist was patient and worked hard with a wide variety of objects to encourage him to say the sounds. It was indeed challenging to have the attention of a 2-year-old who wants to have his way but she did it. And then finally one day, he said “bow” during therapy. Though it was a moment we had long waited for, it seemed to have occurred suddenly and caught us by surprise! My therapist exclaimed “Oh my God, he said it! Hallelujah!”. He refused to say “b” again during the rest of the session. In the coming few weeks, he continued to say ‘b’ more frequently and was consistent in some of the words . She continued to work on ‘b’ and ‘p’ until September 2014 when he turned 3 and was no longer eligible for the EI services. I bade farewell to both my therapists ( hearing and speech) with a heavy heart. Both were excellent teachers who worked sincerely with Adith and he had improved a lot under them. Now at age 3, Adith was eligible to be a full-time student at DePaul school where he had been going since he was 19 months. We started with 3 days a week and eventually moved up to 5 days a week. He was to receive classes in language, vocabulary and individual speech therapy every day. Very soon, I realized that Adith was in excellent hands wrt speech. The Speech Therapist at school was a recent graduate, full of energy and loaded with ideas to keep a 3-year-old engaged. Adith absolutely enjoyed the speech sessions! She came up with several interesting tasks that focussed on providing plenty of auditory input. She also gave homework on a daily basis and a thick folder to practice during vacation! Slowly he could say b in all places and p in some words. By a variety of activities like hiding, glueing and using interesting props, she was able to bombard him with the sounds and elicit the sounds from him. By May 2015, after 18 months of therapy, he could say m,b and p in all positions of words and could finally call Loveson as Pappa. He still has trouble with the blends like ‘blue’ and ‘present’ but does good otherwise! Though the therapy was focussed on the bilabials (m,b and p), he acquired several sounds over the course of 2 years namely h,n,w,y,t,d and ng. This meant he could say more words clearly and his speech was becoming more intelligible. In 2015, he started saying the sounds sh,ch,j and th in most words which improved his speech even further! When months passed by with no luck with the bilabials in 2014, I was in utter despair and reached out to several moms hoping to get a breakthrough. The response that bilabials were relatively easy and it was “f” and “s” that the children had trouble with, scared me even further! While in the shower, during my meals, while having tea and almost every hour of the day, I could only think of how to make him say ‘b’ and ‘p’. One of his therapists once told me “Adith is actually a step ahead, in the wrong way!”. She was referring to him being able to say |k| and |g| with no formal training! Because his first sounds were the back-end ones, he had a very tough time with the frontal sounds. We blew bubbles and popped them, played with ball and blocks, read plenty of books with ‘b’ and ‘p’ words and so on. I also made a photo book with ‘p’ words – Adith in the park, holding a present, standing near the stop sign etc. It was indeed a long journey but now when I hear him say the words correctly, it is music to my ears and I cherish it!! I am so proud of you and astounded by the learning you have gained. I hope many parents will find this blog useful . Aww.. Thankyou so much!! I did not really have a choice other than digging deep into this! Diyappa you are bringing tears to my eyes. The struggles, the determination,the triumphs,never say die spirit in you….